New photos of the Player 2 Exclusives have been added to the story. See updated info below. 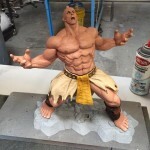 Pop Culture Shock has fully revealed their upcoming Street Fighter V Necalli – V-Trigger 1/6 Scale Statue. There will be multiple versions available. Pre-order start on Monday January 25th at 3:00 PM Pacific Time at PopCultureShockToys.com. Read on to see images of the statues. We’ll update when further images of the exclusive editions are revealed. At Capcom Cup this weekend, Pop Culture Shock debuted their Street Fighter V Nacalli V-Trigger 1/6 Scale Statue. In this weeks newsletter, they shared a photo of the painted statue. They also shared a photo for a new Ken Masters. This is a 1/18 Scale 3D printed item. The newsletter says this is a preview of potential things to come. Finally, they shared a photo of “Monster Feet” for an upcoming 1/6 scale articulated figure. Could it be Blanka? We’ll update when more info becomes available. Read on for the previews. One of the new characters coming to Street Fighter V is Necalli. The Mexican fighter was fully revealed during EVO 2015. He will be one of at least four new characters being introduced in Street Fighter V. Not much is known about the character at this time. 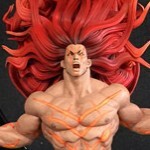 Pop Culture Shock has revealed they will be making a statue based on the new character. The Street Fighter V Necalli 1/6 Scale Statue will make its public debut on December 6th at CAPCOM CUP, which will take place during the Playstation Experience event. You can check out the teaser photo after the jump.